In Sumba, as in many parts of Indonesia, textiles represent one of the most significant art forms. The most fully developed textile tradition existed in the east of the island where textiles were made to fulfil ritual, ceremonial and everyday functions. One of the most distinctive Sumbanese cloths is the hinggi (man's shawl), a very large cloth decorated with bold designs in a warp ikat. 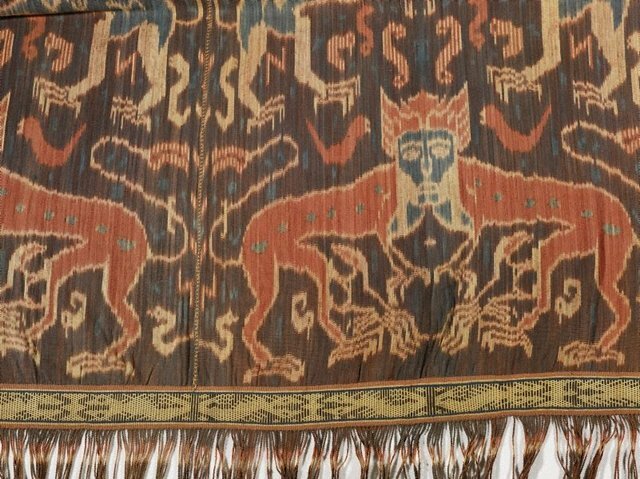 Usually a pair is made; one is worn as a sarong, while the other is folded over the shoulder as a long scarf or used as a shawl.This very large example suggests that it belonged to someone of an aristocratic clan. The textile is decorated with an armorial design of paired lions, an imitation of the Dutch coat of arms and regarded as a symbol of prestige. It is designed in accordance with the idea that a person is able to acquire special powers and qualities of the images depicted on the cloth. The animals are rendered in large scale, a stylistic tendency which suggests that this textile dates to the mid-1970's.